Blogger or Blogspot both are same thing. 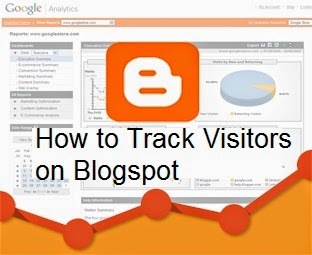 You can track visitors of your blog using Google Analytics. How to Track Visitors on Blogspot ? How to Create Google Analytics Account ? Go to Google Analytics Website. Click on "Access Google Analytics" and Login. Enter details of Account Name, Website name, Website URL, industry category, reporting time zone. Click on "Get Tracking Id". Click "I Agree" on Google Analytics terms of Service popup. Now it will show you a "Tracking-ID" and HTML Code. How to Add Google Analytics code in Blogger blog ? Paste the copied HTML analytics code before </head>. Go to "Google Analytics" and enter your Google Analytics tracking-ID in "Analytics Web Property ID" box.